There is a battle going on in the kitchen: a struggle for dominance over food. The first strategy one must take when facing a formidable opponent such as chicken and potatoes is to divide and conquer. Together, the oh-so-delicious taste of potatoes cooked in chicken fat can overcome any defense one can muster. 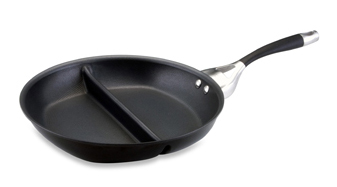 Therefore, they must be kept apart using a tool such as the Circulon Cook Great Look Great 12-inch Divided Skillet. Featuring a divider down the middle, the pan keeps food separated as it cooks—even though it all gets mixed up in the stomach anyways.